Advanced, individual battery charging, AA and AAA cells. 4 individual LED charging lights. Battery detection technology – auto shut off. Panasonic brand name. Retractable plug. Fully charge eneloop AA cells in 7 hours, AAA in 6 hours (approx. ). AC100 – 240V, 50/60Hz. * Based on IEC 61951-2(7.3.2). ** Battery life based on testing method established by IEC 61951-2(7.5.1.3). Results may vary based on conditions of use. *** As certified by The Green Energy Certification Center **** Storage at 20° (68F) ambient conditions (Discharge: . 2lt, E. V equals 1.0V) (varies according to conditions of use). eneloop batteries need a charger to be recharged. Panasonic Ni-MH battery charger recommended. This advanced AC charger is designed to charge battery cells individually; allowing you the freedom to completely charge fully discharged cells or just “top off” the charge of AA or AAA cells that are only partially drained. The single cell charge capability allows any combination of one, two, three or four AA or AAA Ni-MH batteries to be charged at the same time. eneloop battery cells can be charged individually in the CC17 charger. Once the batteries are installed in the charger, and the unit is plugged into an AC outlet, the corresponding LED indicator light turn on and become solid green while charging. Once the charging process has been completed, the charging function and the green LED light will turn off (for that specific battery cell). There is one LED charging indicator light for each installed battery, up to four batteries at a time. (Indicator lights are located inside the charger and are only visible when a battery cell has been correctly inserted into the charger and the unit is plugged into a power outlet). The Panasonic CC17, 4-position Ni-MH rechargeable battery charger is designed to charge your eneloop and eneloop pro battery cells safely and efficiently. 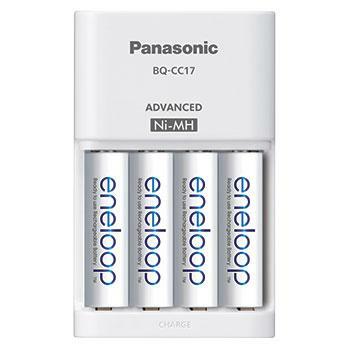 Fully drained eneloop AA batteries can be completely recharged in approximately 7 hours, and (fully discharged) eneloop pro AA Ni-MH batteries in approximately 9 hours. To ensure safety, the CC17 charger has built-in battery sensing technology that will automatically stop the charging process, if a non-rechargeable battery is inserted into the unit. The charger will also stop charging if batteries become overheated during the charging process. The CC17, charger features an ultra-convenient retractable AC plug, for direct connection to an AC wall outlet - no detachable cables! The charger is extremely portable and easy to store when not in use. The CC17 charger delivers a consistent, stable 300mA charging current for AA batteries or 150mA charging current for AAA batteries. An important feature that helps keep your eneloop batteries cells from degrading during the charging process. This charger accepts input voltages ranging from 100 to 240V, 50/60Hz for convenient, safe use internationally.